Alicia Yarbrough is the Chef and President of Yummie Creations, Inc. Alicia was born and raised in Saluda, South Carolina and graduated from Saluda High School in 1990. She attended Johnson and Wales University in Charleston, SC and Providence, RI. Alicia has two degrees from Johnson & Wales - an Associate Degree in Culinary Arts she earned in 1992 and a Bachelor of Science in Foodservice Management she earned in 1994. The name - Yummie Creations - comes from Alicia's nickname at school - Yummie! Alicia credits her love of cooking to her maternal grandmother, Imo Corley Matthews, who was her first cooking instructor. Alicia is a member of the Silver Key Honor Society and is listed in Who's Who Among American Universities. She was on the Dean's List and received a Four Year Attendance Award. Alicia has worked as a Grill Cook, an Associate Instructor and Kitchen Manager for California Dreaming in Charleston; Front of the House Manager, Back of the House Manager, Chef/Server and Kitchen Manager for Happy Cookers Catering in Columbia; Evening Sous Chef for the Summit Club in Columbia, SC and as a Private Chef in Irmo. 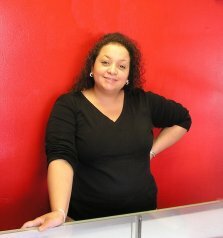 Alicia opened the doors of Yummie Creations, on December 1, 2003.